Experience the 48LEDs Bright Flagpole Night Lighting! -The solar night light can be suitable for various occasions, coutyard, camping activities, roadside etc. Energy Saving and durable. -The flagpole light comes with carabiner, which can be hung as a night light. 1. Please remove the film on the solar panel and push the switch to ON before using. 2. You may face down or cover the solar panel to make sure its on. And please keep the panel clean. ★[48LED And 3 Modes] An upgraded model more brighter solar flag pole light VS. 24LED or 30LED. Three modes: High, Medium and Low brightness. Three modes switch freely, choose the most suitable brightness for your flag. ★[Energy-saving] 11 PCs powerful solar panels auto get charged during day, light up on flagpole topper at night, assure long-lasting lighting, much eco-friendly and energy-saving. ★[Auto ON/OFF] Automatically turns on at night and turns off in the daylight. Please push the switch to ON before installation. Face down or cover the solar panel, it's ON if light up. If not, press the button once to set it ON. 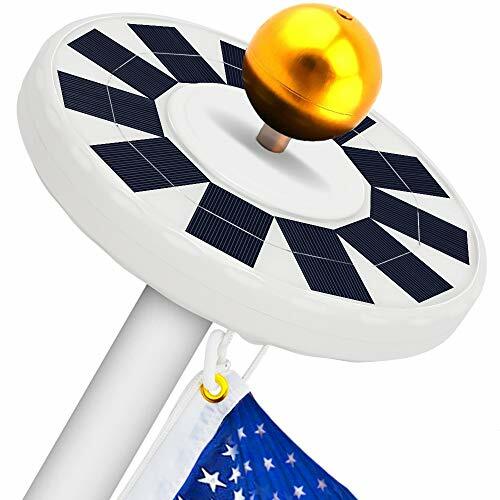 ★[ Easy-installation] Solar flag pole light fits for flagpoles with 0.55in thread hole; no hassling with wires nor special tools required. Pls note that the ornament ball is NOT included. If you have any questions about this product by Hallomall, contact us by completing and submitting the form below. If you are looking for a specif part number, please include it with your message. LED Deck Lights - Pack of 10 - Color Changing - RGB - Multicolor - Includes All Wires, Plug in Transformer and Remote Control Sensor - Recessed Wood Decking Yard Garden Outdoor Flush Mount 1-1/2"